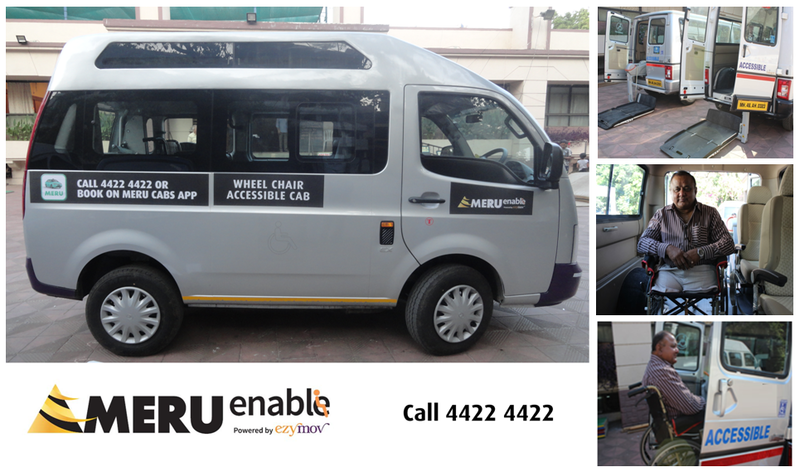 Meru Cabs, India's most preferred cab service today announced the launch of a specialized service for differently abled and elderly commuters called 'Meru Enable' in association with Ezy Mov. Meru Enable fleet is equipped with a state-of-the-art hydraulic lift, which can comfortably lifts the passenger seating in a wheelchairs & helps him/her directly board the cab without any support of anyone. The cab interiors are specially designed & modified to accommodate the wheelchair & 3 co-passengers. This specially designed fleet of cabs enables the people with special needs to commute across the city with or without any caregiver, giving them freedom to travel independently. It also has specific space to keep their belongings, extra room for caregivers/co-passengers, amongst several other elements to ensure a comfortable travel experience for people with specialized needs. Employing spacious vehicles, this distinctive service has been customized to fulfill the needs of a unique set of travelers that include elderly citizens, pregnant women, differently abled passengers and medically obese persons. Apart from handling wheelchairs, creating adequate space and driving with care, drivers of Meru Enable undergo special training and are sensitized to assisting passengers with mobility constraints. Piloted in Mumbai, the service will soon be available in Delhi and Bangalore by second half of 2016 followed by Chennai, Hyderabad and Kolkata in early 2017. Speaking on the launch, Mr. Siddhartha Pahwa, Group CEO Meru Cabs commented, "With a fleet of over 20,000 cabs on road serving over 6 million passengers, Meru Cabs now expands its travel portfolio by providing differently abled commuters an affordable and comfortable cab journey with the launch of Meru Enable." Branded with a distinct purple bumper with a white/silver body color, Meru Enable by Meru Cabs will be conveniently accessible through its dedicated 24x7 call center 4422 4422. Going forward, the service can also be booked via Meru Cabs App. Since inception, like all Meru cabs, Meru Enable cabs are also equipped with GPS, GPRS which could be tracked on a 24X7 basis. Making travel convenient for its customers, Meru Cabs were the first to launch a new ride sharing service, named 'CarPool' across India in September 2015 followed by the launch of 'Ride-Share' in December 2015, a feature to provide commuters with yet another convenient and eco-friendly travel option. A service introduced specifically for the national capital region, Ride-Share aimed to address two pressing issues impacting Delhi commuters pertaining to rising pollution and growing traffic congestion. Integrated on to the 'Meru Cabs' mobile app, both services offer ride sharing options for people traveling in the same direction or area.